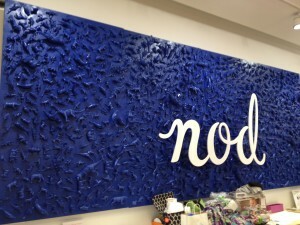 The flagship location of the Land of Nod (900 W. North Ave., Chicago, 312-475-9903) has a dramatic, whimsical piece of art behind the checkout counter. 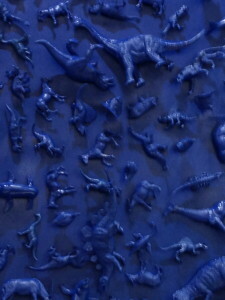 My iPhone photos are not doing it justice, but it consists of dinosaur toys affixed to an enormous canvas, unified by blue paint. I loved it and decided to try it myself. This idea works with almost any theme or toy so you can customize it to your kid’s room or play room. I chose outer space. 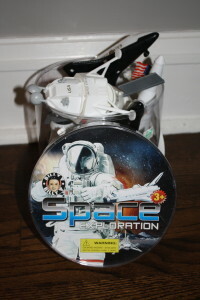 I bought this bucket full of space-themed goodies at a craft store for about $15 (with a coupon), not bad bang for the buck considering it came with enough pieces to fill a canvas. 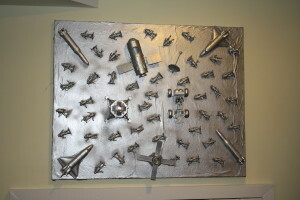 The end result, hanging in the play room. When my toddler saw it, he gasped and said “That is so cool. 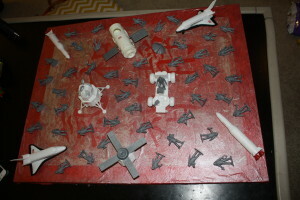 Look at the outer space!” The total cost was $21 for the toys and spray paint, and it took less than an hour total (excluding spray paint drying time.) Happy crafting!